John Reynolds is a producer, writer and musician. His credits across that range of roles include musical partnerships and collaborations with a diverse, multi- cultural and inspiring spectrum of world-class artists. John’s musical career began with drumming and percussion, when he toured the world performing with the ground-breaking bassist Jah Wobble. He has also worked with a jaw-dropping range of musicians, including Peter Gabriel, Natacha Atlas and Nusrat Fateh Ali Khan, Kirsty MacColl, Adam Ant, Cara Dillon, Simply Red, Björk, Sharon Shannon and U2. John has also been one of Sinead O’Connor’s staunchest supporters and collaborators, representing a significant influence throughout her career. Previously married to Sinead, he worked with her as a writer, producer, performer and Musical Director. Credits include Sinead’s stunning debut album, “The Lion and The Cobra”, “I Do Not Want What I Have Not Got”, “Universal Mother” (for which he was nominated as Q Producer of the Year), and the “Gospel Oak” EP. John also collaborated with Brian Eno to produce tracks for “Faith and Courage” as well as “She Who Dwells…”. John’s other production and performance credits include Sunhouse’s “Crazy on the Weekend”, which was declared “a classic” by Uncut Magazine, and “Come on Now Social” by The Indigo Girls, which attracted similar critical acclaim. Also, in a slight shift of direction, John played on Björk’s single, “Play Dead”. In 1997, John formed Ghostland with long-time collaborators virtuoso cellist Caroline Dale and Robert Plant’s guitarist Justin Adams. Their eponymous debut album was commended by Uncut Magazine as “a stunning soundtrack of beats, ambient stylings and startling dynamics”. Released in July 2001, their haunting and atmospheric second album, “Interview with the Angel”, also received international support from critics and fans alike. Based in London, John also devotes much of his time, energy and passion to his CLEAR Studio. With the ability to expand from traditional band formations to plush orchestral arrangements, CLEAR has generated some truly exceptional music productions, including “Seize the Day” the Irish double platinum album by Damien Dempsey as well as Dempsey’s Number 1 album, “Shots” and his 2007 No. 2 album “To Hell or Barbados”; Hothouse Flowers No. 2 album, “Into Your Heart”; John Spillane’s No. 4 album, “Hey Dreamer” as well his 2008 chart album “My Dark Rosaleen & The Island of Dreams”; “Caravan” by Canadian tumbleweed-pop duo Madviolet and “Voila”, the first French language album from Belinda Carlisle. 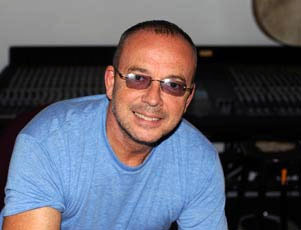 He has also worked on projects with Herbie Hancock, Brian Eno and Robert Plant. More recently, John has produced the 5th studio album by Damien Dempsey (“The Rocky Road”) as well as “Music from Ireland – Welcome Home” to accompany a PBS documentary series hosted by Moya Brennan. The album features performances by Moya, Sinead O’Connor, Glenn Hansard, Damien Rice, Shane MacGowan, Andrea Corr, Damien Dempsey and Donal Lunny among others. John also produced the debut album by Kerry duo “Lumiere”(Pauline Scanlon and Eilis Kennedy). He worked with David Byrne on “Here Lies Love” a double CD collaboration with Fatboy Slim with contributions from Florence Welch (Florence and the Machine), Tori Amos, Cyndi Lauper, Steve Earle and others.